1. Sift flour and dry roast in a medium flame till you get a nice aroma. 2. Take sugar in a deep pan and add approximately 1/4 cup of water. The water should just cover the sugar. 3. Boil for 7-8 minutes on a medium flame and when the syrup is in one string consistency, add flour. Stir continously. 4. Add ghee a little by little. After 2 minutes, the mixture will absorb all ghee and starts to leave the sides of the pan. 5. At this stage, transfer the contents to a ghee greased plate. Spread evenly with a flat spatula. 6. Cut in to desired shape when warm. A Very Happy New Year Nithu & Bala. Maysore pak looks really delicious.. Happy new year.. The burfi looks very delicious and beautiful! Happy New Year to you and your family! I tried lot of times different types of mysore pak. I want to try next time. This is one looks very easy. Happy new year to you too dear. I love this sweet anytime of the day. Thats a great looking mysore pak,so tempting..Happy new year wishes to u and ur family.. 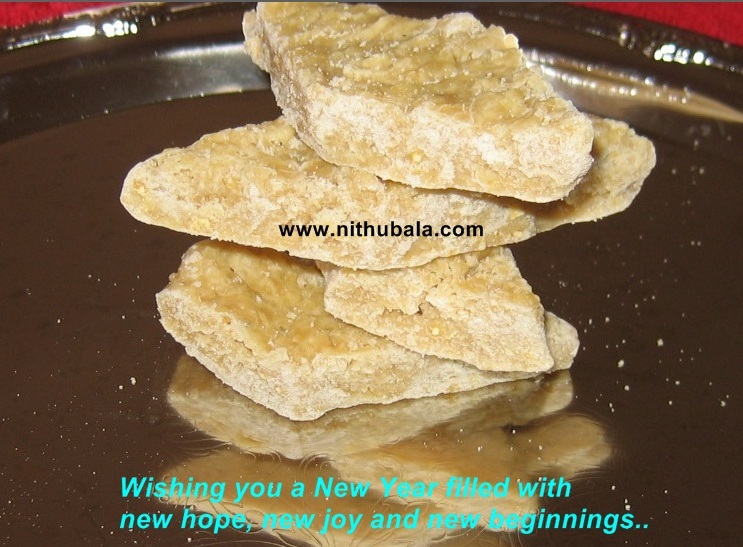 Happy New year Nithu! Have a Safe and Healthy year ahead!